It’s that time of year again! The best time of year if you ask me (and not just because it’s my birthday!). No, it’s the Black Friday sales week of course; and this year I’ve teamed up with the only place I buy my designer brands from; Farfetch. If you haven’t seen my blog post from earlier in the year, where I explored Farfetch’s vintage section (absolute heaven! ), then let me introduce you to the website that’s been a major designer game changer! Farfetch does what it says on the tin; it fetches designer items from boutiques in far away lands (UK suppliers too), enabling you to get your hands on the best priced, must have designer pieces that you may not be able to find here in the UK stores. I found my beloved JW Anderson ‘Pierce Bag’ with a massive £300 saving, as the boutique it was sourced from was having a sale. Since then, it’s the first place I’ve gone for anything from Gucci loafers, to Loewe dream bags. This time, I’ve been hunting down my favourite pieces ahead of their Black Friday sale. I’ve given you some of AW18’s major trends along with some staples that you need in your life - enjoy! Etro Tartan Wool Trousers - Starting off with some absolute gems; tartan pants! If you’ve not seen them all over instagram, then keep an eye out for this winter trend that I’m 100% on board with. Team with a chunky cream knit for the ultimate chic look! Alexander McQueen Chunky Sweater - Everyone needs a chunky knit sweater in their wardrobe. It’s not only a classic, it’s also the perfect way to to keep warm and chic in style. I’m obsessed with every single aspect of this Alexander McQueen jumper. Yes, it’s pricey, but with the discount, you’re practically making money; as cost per wear over the years will definitely work out well! 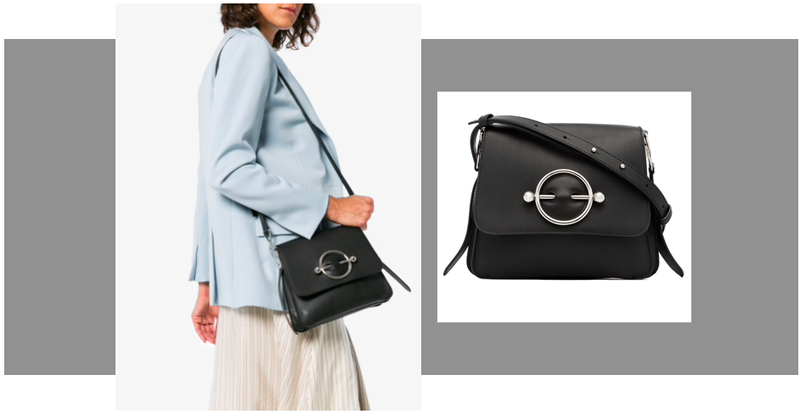 JW Anderson Black Disc Bag - If you already follow me, you’ll know how much I love my JW Anderson Pierce Shoulder bag. But this is the new kid on the block, and safe to say I’m obsessed. It’s also super handy over the body bag, something I’ve found I missed with the shoulder bag. Yes to this! Stella McCartney Eclipse Trainers - Okay, so I’ve clearly gone mad for the ugly trainer trend this year, but you know, too much is never enough! And I obviously need a pink Stella McCartney pair. I love that they’re just the right amount of “chunk”, but guarantee my dad will hate them! Calvin Klein Claire Western Boots - Cowboy boots. Slightly marmite-esque, and something I wasn’t super keen on when I saw them on the catwalks. But since I’ve seen how chic they can look (thanks to Instagram) I’m now on the hunt for the perfect pair…and think I’ve found them with these CK dreams! They’re not too Milky Bar Kid, and the black patent makes them an instant classic that will go with everything!